We've slowly been decorating our new home since moving in. The first rooms we did were the kitchen, breakfast nook, and main living area. The paint turned out totally different than what we expected. We wanted a nice, subtle green and a golden taupe color, but instead we got bright yellow and a not so pretty green. We felt like we were in a 7-up commercial with the lemon-lime scheme we had going on. LOL. So last month we took advantage of Sherwin Williams 20% off sale (which now I think they are having a 30% sale going on..figures!). We repainted that whole area. We also hung some pictures (finally!) and revamped a table. Matt had a glass table that he bought when he first moved out on his own. It has been in storage for most of the time we've been together. A child + glass table = an always smudgy table. However, we decided we wanted a "bistro" look in our breakfast nook, so we brought the table back. We spray painted the table and chairs and recovered the cushions. It turned out beautifully. The breakfast nook is the only area that is pretty much completely done. The rest of the space needs pictures and some other touches. We are thinking of re-doing the fireplace, but that won't be for awhile. That is a big project. We want to be able to hang a t.v. over the mantle because that would give us so much more space to arrange the furniture. To do that we will need to lower the fireplace and while we're at it we thought we may take away the bricks and put stone or tile around it. But we still need to think about that some more. We also want to put wood floors throughout the bottom level of the house (except for the kitchen and our room). I can't wait to do that! 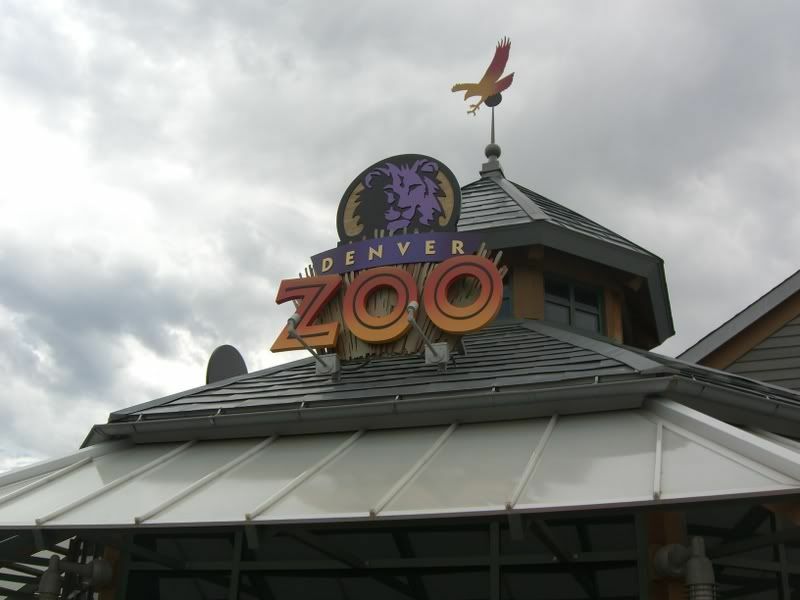 While we were in Colorado we also went to the zoo and a Rockie's game! We saw many, many animals. It was a blast! 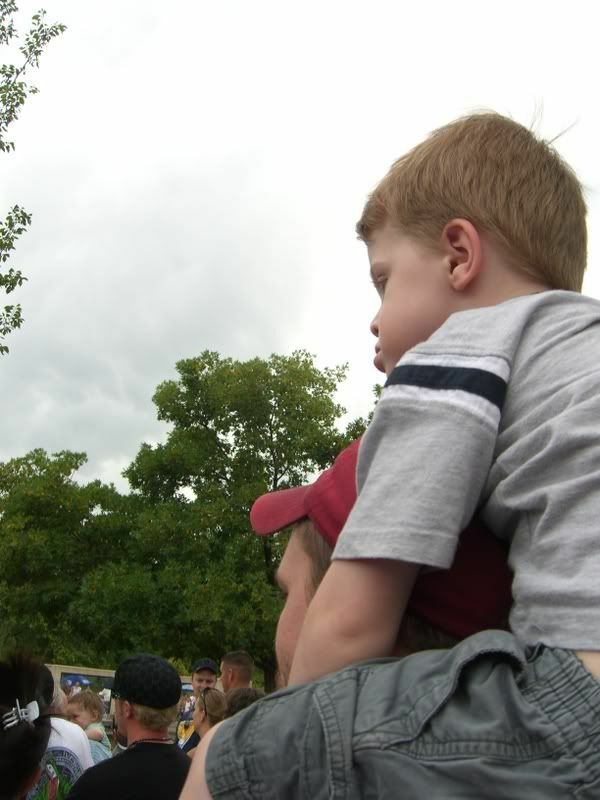 Here Holden is sitting on Daddy's shoulders watching the sea lion show. 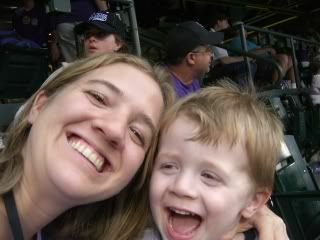 After the zoo we rushed over to Coor's Field to watch the Rockie's game. 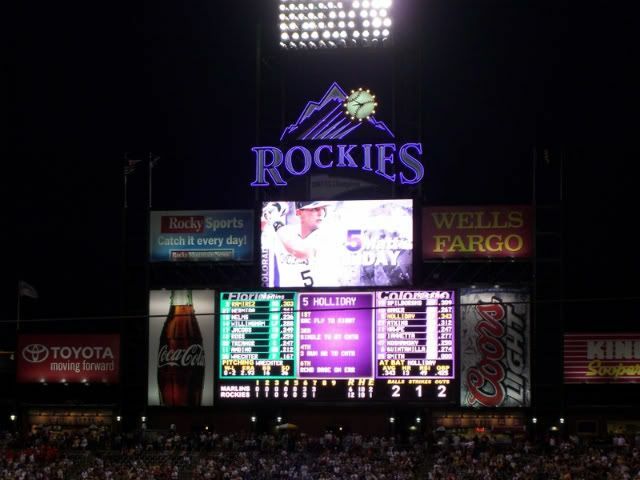 The Rockie's won against the Florida Marlins! It was a very busy day. It sure wore Holden out. Before we even got back to my inlaw's house he was fast asleep. I know I haven't finished posting pictures from our trip that we took in early July.. but I wanted to blog about something different tonight. I will get back to the trip pictures later. Last week we went swimming while my mother-in-law was in town. We have a gym membership so we go swimming there occasionally. We took Holden to the daycare at first so we could have some no-kid swim time. After awhile we went and got him so he could join in on the fun. Poor thing.. when Matt went to pick him up he was crying. The staff said he had cried the. whole. time. He even climbed up to the top of the jungle gym to cry and one of the girls had to go up there an get him. When Matt asked what was wrong he said, "Need to go pee pee." For some reason we can't get him to ask the staff when he has to go. So instead he held it the entire time. The gym has a really cool kiddie pool area. It has slides and a bucket at the top that fills with water and pours out. Unfortunately Holden has a fear of water falling on his head so he pretty much avoids that. He does wade around the edge and I even got him to go on the slide a couple times with me. Here he is getting used the water with Daddy. I like this picture. My baby has such pretty, blue eyes. Holden soon got bored of the kiddie pool and wanted to venture out into the big pool. Holden's favorite part and probably Matt's most un-favorite part was playing basketball in the pool. Matt got a workout on his arms that's for sure. Ha.. It's been a long long time since I have updated my blog. For a combination of reasons.. we've been busy painting our house, we've been out of town, and mostly I've just been being lazy. Right now my mother-in-law is in town visiting. We just got back from swimming and boy are we tired. Earlier this Summer we took at trip to Colorado. 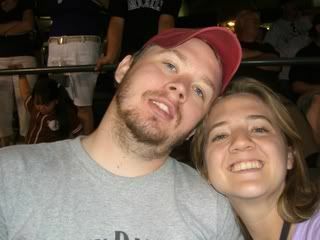 We did so much stuff. Our time there was jam packed. It was a lot of fun. And as always I took a lot of pictures. 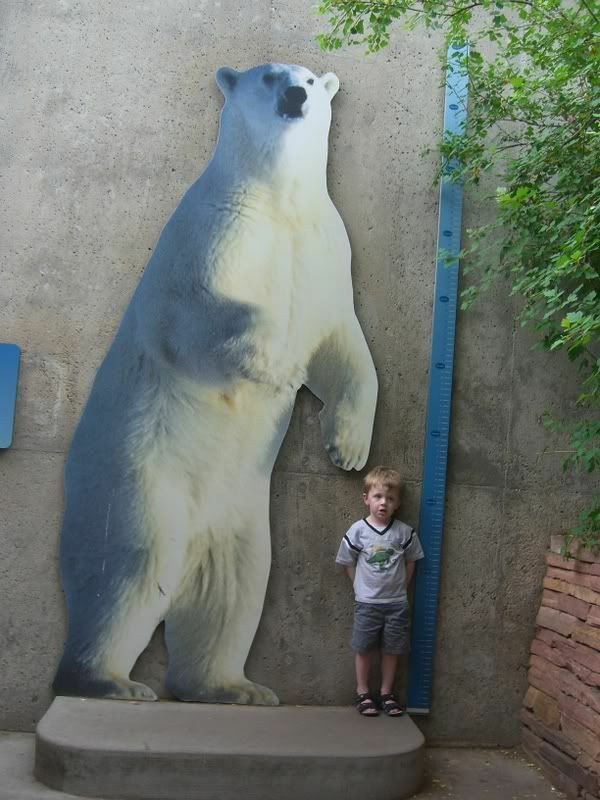 On July 4th we went to Elitch Gardens. 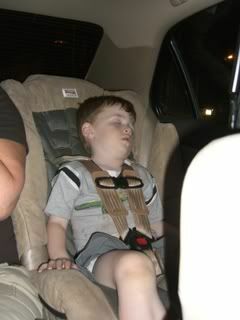 Holden was very tired from the get-go because we made the mistake of telling him the night before that we were going. I guess he was too excited to sleep. He didn't fall asleep 'til nearly midnight and was up around 6 a.m. Yikes! Despite that he still had a blast...he was just a little zombie-like. You can see what I mean by looking at this picture of him on the carousel. Acts just like his Mama on scary rides...LOL. Holden chillin' in his wagon. This wagon really came in handy. We used it for carrying around kids (duh) and also a place to pile all of our stuff. Holden left the park in style, lounging in his wagon as his Daddy pulled him along. He konked out in the car barely 5 mintues after leaving... he was pooped.